Ley lines are straight tracks or paths which connect ancient and sacred sites in straight lines stretching across the landscape. 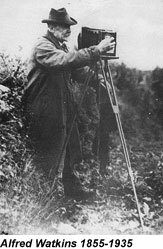 The concept of ley lines came to Alfred Watkins, a locally well-known Herefordshire businessman and amateur archaeologist, on 30 June 1921. As he was looking for features of interest on a map of the Blackwardine area, he noticed many of the footpaths therein seemed to connect one hilltop to another in a straight line. He later claimed that he saw “in a flash” a whole pattern of lines stretching across the landscape, although he had no underlying theory for their function. After this sudden revelation, Watkins gradually became convinced that these ley lines were the remnants of Neolithic trading routes. In 1922, Watkins published his first book about Leys, called the "Early British Trackways". During the next three years he continued to amass evidence to back up his proposals concerning Ley Lines. His best known book on the subject, "The Old Straight Track", first published in 1925, is still in print. Ley lines are thought to be magnetic in nature, the same "lines" that birds, mammals, insects and bacteria use to migrate across long distances. Many ancient and more recent man-made structures are thought to be built on ley lines, or at the point where two or more ley lines interconnect. Examples include Stonehenge, mounds, churches, roads, and so on. The point where the lines meet often coincide with an energy vortex. These sites are considered sacred. Ley lines and their intersection points are believed by some to resonate a special psychic or mystical energy, often including elements such as geomancy, dowsing or UFOs, stating that, for instance, UFOs use these magnetic or electrical paths to traverse the earth’s surface. Another theory suggests that these lines are the product of ancient surveying, property markings, or commonly traveled pathways. Archeologists have documented the traditional employment of straight lines between points of use in numerous societies, ancient and modern.